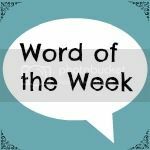 Share the post "Word of the Week – 13/3/15"
Hello and welcome to Word of the Week! Thanks to those of you that linked you last week, as always, it was lovely reading all of your posts. And thanks for all of the anniversary and weekend away well-wishes, lovely of you all. We had a great time, thank you, and of course, it flew by! We have, at last, redecorated our kitchen. We extended and put a new kitchen into our home 8 years ago, so it had been starting to look a bit tired and in need of re-painting. We bought the paint towards the end of last year, and then struggled to find the time to do it, so we finally got a man in to do it, and he’s been and freshened it all up this week. I am so happy! So this week has been all about dust sheets, paint smells, shouting ‘no’ urgently at the kids whenever they went near any drying paintwork, and shopping for new accessories for it. We’d bought a new toaster, kettle and microwave a few weeks ago in readiness, so we’ve got those out and rearranged all of our work tops, furniture, cleared out cupboards, and it’s now feeling like I have a brand new kitchen. Amazing what a lick of paint can do! Beth Twinderelmo recently posted…The Power Of A Nail Varnish! ooh a new kitchen (almost!) sounds great! I’m looking forward to the makeover pics! Exciting times! I Love a freshly decorated room, and then having an excuse to buy all new accessories to tie in ;). Looking forward to the update!. Oooh lovely! Our kitchen needs a makeover… not sure when it will get done though! So much easier when you get a man in to do stuff like that 🙂 or at least I think so! Fantastic, it’s so nice to have freshly redecorated rooms and the kitchen is such a tricky one to do, it must feel so good. I love a room after it has just been re-decorated, we just did our office, and it looks so good. I can only imagine how great it must be to have done your kitchen. And great choice of word. How exciting about your kitchen! I can’t wait to see the pictures next week. I have been in the process of redecorating my bedroom for a few months now but my health has gotten in the way of completing it. Hoping to get it done SOON as I do not have much in the way of patience most of the time and I really just want it to be done already. Wishing you a lovely weekend and I’ll talk to you next week! That’s brilliant! Sometimes, just a lick of paint is enough to make you feel like you’ve got a brand new room, isn’t it? I love it when we freshen up a room, change a few things here and there. I haven’t done that in ages! Mel recently posted…Red Nose Day & Who Won a £50 HomeSense Voucher? Wow! How exciting! Looking forward to your updates and pictures. Loving your word of the week linky. It should be OK now? Others have entered and I can see it, so hoping it is! Worked perfectly this time round 🙂 thank you. So glad you got the redecorating of your kitchen done. It seems like you can be really satisfied with the result. Hi Jocelyn, I envy you as our kitchen/ house needs a good lick of paint to get it looking fresh again. It’s actually been on the cards for the past two years, but we just never get there. My husband works long hours in the summer, but hopefully next winter…. Looking forward to seeing the pictures, it’s great how a new splash of colour can transform a room. I’ve linked up last week’s and this week’s as I was busy being nurse Mumma last weekend and forgot to link. Oh a kitchen makeover must feel glorious! It’s the one place in the home that I seem to spend so much time, and I’m dying to get revive my kitchen!